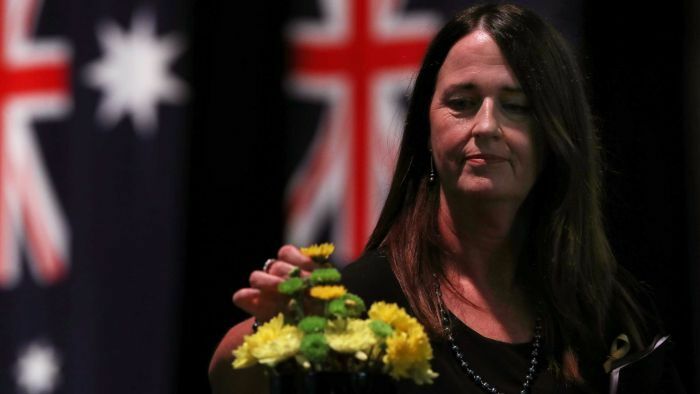 The Black Saturday bushfires which claimed the lives of 173 people on February 7, 2009 brought out the very best in people, giving victims the strength they needed to begin the process of recovery, a special commemoration service in Melbourne has been told. Hundreds of people gathered at Melbourne’s Royal Exhibition Centre to mark a decade of rebuilding and recovery from one of the worst fires in Australia’s recorded history. About 200 family members of those affected by the fires attended, along with dignitaries including Victorian Premier Daniel Andrews, the Governor of Victoria, Linda Dessau and Prime Minister Scott Morrison. There was a minute of silence for those who died, as well as reflections from members of the CFA and an affected primary school. Dr Kathy Rowe lost her husband in the fires and spoke on behalf of the bereaved. “It’s hard to believe that it’s been 10 years but on the other hand it sometimes feels so raw that it feels like yesterday,” she told the service. “Seeing the gradual return of birds over six or seven years helped me realise that we can all recover. Jane Hayward, the principal of Strathewen Primary School, which was destroyed in the fires, said they were left with nothing after the fires went through. Then, the offers of support started to roll in. The theme of renewal underpins a new exhibition on the Black Saturday fires next door at the Melbourne Museum. “Ten years may have passed but the story of the 2009 bushfires continues to live on in our lives, our hearts and our memories,” said exhibition curator Catherine Forge. Victoria’s Governor, Linda Dessau, said the numbers of the people, homes, farms and businesses tell a small part of the devastating story. “Figures alone will never tell us that the houses lost were in fact homes, homes that sheltered not only families and possessions, but the precious mementos and memories of family life,” she said. Speakers and members of the audience were invited to lay flowers on a map of Victoria, symbolising the regrowth and rebuilding and acknowledging the impact of the bushfires on the state. The official anniversary will be marked quietly by the bushfire-affected communities on Thursday.